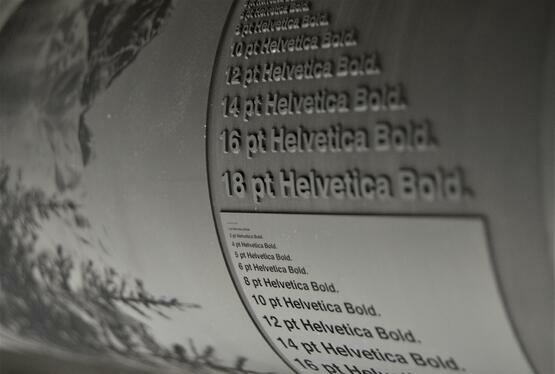 The practice of direct laser engraving (DLE) sleeves, cylinders, and plates is emerging at the forefront of the flexographic printing industry. Why? Because it virtually eliminates most flexo printing errors on the press related to misregistration, ink transfer, and plate swelling. This is particularly true when direct laser engraving is used to produce an image on in-the-round (ITR) elastomer sleeves. Other efficiency, quality, and cost benefits will make DLE a force in the flexo market for years to come. The lightning-paced flexible packaging industry requires higher-speed printing to increase efficiencies with production. Laser-ablated in-the-round sleeves are the picture of efficiency. What’s more, ITR sleeves allow for faster press speeds. Pre-press mounting is quicker, and they require very little of the press downtime needed to remount and retape flat plates. Decreased risk of skewed imagery from misalignment also means less press downtime and wasted substrate while struggling to find the perfect register. Labels work best with laser-engraved ITR elastomer sleeves. Elastomer’s physical properties work well with all sleeve sizes needed to print any size label. Expect DLE growth in this market as the technology progresses and becomes more commonplace, particularly as it pertains to pharmaceutical/medical labeling and packaging. Mounting flat plates takes time and creates potential for registration problems. The corrugated industry knows the issue of misregistration well. Desperately need the quality production on the press? Laser ablating elastomer plates and sleeves is now more precise than ever. Precision equals high definition. Traditional plates simply have their limitations. Jobs requiring higher ink densities, higher line screens, and smoother vignettes also can benefit from DLE. Packaging like this (often used for liquid carriers and non-perishable food items) typically requires ultraviolet-cured inks, which work best with elastomer sleeves. In this case, you especially need to avoid the harmful effects that abrasive inks and strong solvents can cause. Again, elastomer plates being ideal for UV inks, in turn, is ideal for this printing application. Direct laser-engraved ITR sleeves also are perfect for the fine detail required. One of the biggest advantages of in-the-round direct laser engraving is reversed-out textext. The industry is long past overlooking misregistration issues and problems with press downtime for mounting and troubleshooting mistakes. The industries you serve move quickly while still demanding quality printing capabilities. You can’t afford to leave both quality and efficiency to chance.